Martim Baptista won the most important title of his young career by winning the U-18 tournament of Oceânico World Kids Golf, whose 10th edition took place at the Oceânico Faldo and at the Oceânico O’Connor, the two courses at the Amendoeira Golf Resort, in Silves, Algarve. 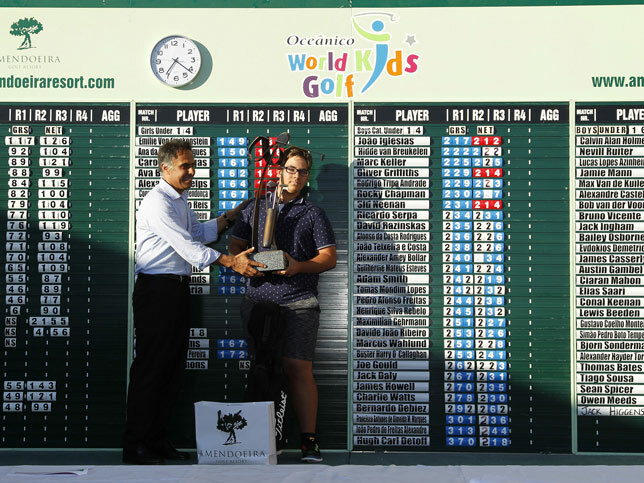 After a first half of the 2018 season which he himself considered to have fallen short of the desired, the player from the Vale de Janelas Club regained his temper at Oceânico World Kids Golf, the most important and historic junior golf tournament in Portugal. The difference is that the boys tournament winner had another special prize – an invitation from the PGA of Portugal to play the Amendoeira Classic, a Portugal Pro Golf Tour event, an international tournament for professionals, with a prize Money of €10,000, to be held in 2019. “I am completely interested in playing the tournament. It’s not normal for us to have this opportunity, to play in a tournament with the professionals,” said Martim Baptista, who scored 230 strokes, 14 over Par of the Oceânico Faldo Course, after rounds of 75, 83 and 72, 2 ‘shots’ better than the big favorite, Gonçalo Teodoro, a member of the Portuguese Golf Federation National squad, and the Dutchman Floris Steunenberg. «This tournament was very motivating. My best finish this year in the Drive Tour tournaments (the main portuguese junior tour) was a top-5. It’s my first win of the year in na official event and maybe it’s one of my best wins ever. This last round, from the white tees, was my best ever result, but I was also playing for the first time in the U-18s,” added the player coached by Luís Barroso. Jessica Adams was also, of course, “very pleased to have won the tournament with a good last round on such a hot day, after having struggled in the first two rounds.” The Englishwoman, who left behind by 11 shots the runner up, the Portuguese Inês Pereira, scores 241 strokes, 25 over Par of the Oceanic O’Connor Course, delivering cards of 85, 82 and 74. “It was already worth coming”, said the Briton who wants to become a professional. One of the highlights of the 10th edition of Oceânico World Kids Golf was the presence of Ladies European Tour (LET) delegation, with the English ‘pro’ Rebecca Hudson, winner of five professional titles, four of which in the LET, and the LET Chairman, Mark Lichtenhein. Since last year the LET has paid special attention to the junior tournament at the Amendoeira Golf Resort and in this year’s speech Mark Lichtenhein praised the increase in the girs participantion department, but stressed that “we need more girls to play.” The LET’s Chairman is talking with Oceânico, and who knows, maybe one day the girls champion will have an invitation to a professional tournament, as it happened this year in the boys tournament. Good news for Portuguese young players who shine every year at Oceânico World Kids Golf. This year, Filipa Capelo won the U16s, after last year being runner-up; Ana da Costa Rodrigues and Inês Belchior were runners-up respectively in the U-14 and U-12, one year after they won in the lower age events; and Maria Francisca Salgado became champion in the U-9. n the men’s section, besides Martim Baptista becoming the first Portuguese U-18 champion since Cristiano Marcela in 2015, there were two more Portuguese winners: Daniel Sardo in the U-10s and João Iglésias in the U-14s. U-18, Martim Baptista (Portugal), 230 strokes (75 + 83 + 72), 14 over Par of the Faldo Course, and Jessica Adams (England), 241 strokes (85 + 82 + 74) 25 over Par of the O’Connor Course. 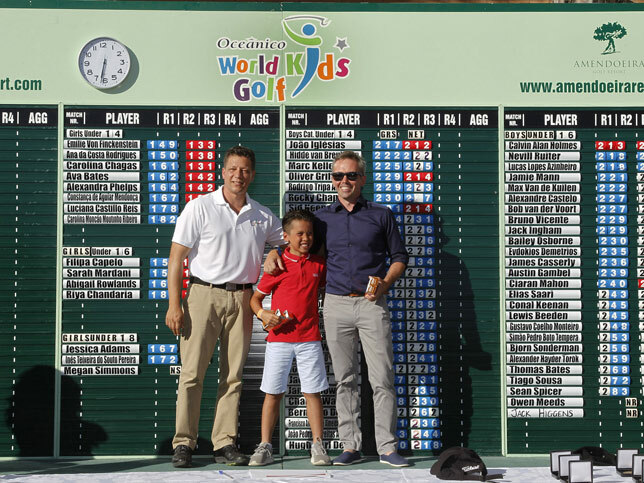 The 10th Oceânico World Kids Golf atracted 147 players from 17 countries and the Child & Parent 9 holes Par-3 Contest was won by Oliver and John Robertson, from England. Ela Clark, from the World Golf Awards, presented the prize giving ceremony, there were more than 100 prizes to be distributed, and the historic 10th edition concluded with a unique red blood moon lunar eclipse and fireworks during the final gala diner. A week to remember.